Tomorrow, many Eurovision fans will go on “Swedish mode”. For six weeks, all they can think about is Melodifestivalen. Their heartbeat will go up and if you can’t join them, it’s best to leave them alone in this period. Under no circumstances must they be approached with life’s triviality during the shows. The blue and yellow flag brings sparkles into the eyes of many Eurovision fans. They are obsessed with Melodifestivalen and for six weeks each February and March, they are unable to have conversation about anything not related to the Swedish selection. No matter where in the world they are from, their biggest goal in life is to learn Swedish. 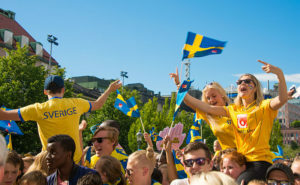 They are Eurovision fans, and as such it has been assumed, it was a part of their DNA to love everything Swedish. Studies however reveals that for a part of the Eurovision fans, things are different. For them Sweden is just one of the 42+ participating countries. They don’t respond, physically or emotionally, to photos of Carola, and they don’t remember the dates of Melodifestivalen so they are likely to have made other arrangements, which no Swedish TV programme can change. Until now this special spices of Eurovision fans haven’t spoken out and as such, not many have been aware of their existence. Don’t assume your fellow Eurovision fan shares your obsession with Sweden – On our team alone, we discovered that we are really different. From the ones who really don’t want to miss anything of Melodifestivalen to the ones who never watched any of it. I’ve been a fan of Melodifestivalen since 2014 and I haven’t missed a single episode since Helena Paparizou sang Survivor. Melodifestivalen has what only a select few Eurovision preselections have, Gravitas. It is an amazing platform for talent from all over Sweden and further afield and of course in its early history produced one of the biggest bands ever, ABBA. I have not always loved the Swedish entry, in fact you have to go back as far as 2013 for the last Swedish entry I favoured, but I still appreciate the production and longevity that Swedish songs in Melodifestivalen have. If you asked me who sang a song in 2016’s Melodifestivalen I could rhyme of their points and position. I couldn’t do that for any other selection. Ultimately Melodifestivalen has fun, cheese and comedy. Yet, it never steers from the fact that it is there to produce a credible entry for Eurovision and they do it impeccably. I started watching Melodifestivalen in 2012, when I became more involved and even more interested in Eurovision. And in the very first Melodifestivalen deltävling, Loreen took part and won it. At that time, I didn’t know I had witnessed of the biggest Eurovision winners in the last decade. From that moment I just knew that I will barely see something better than this show. And so I try not to miss a single show even though I have to skip some because of my tight schedule. The show evolves every year, but still stays the best a Eurovision fan can dream of. So book every February and early March and prepare for the world-famous Mello, Melfest or just Melodifestivalen. I have always looked forward to hearing what song Sweden will bring to the contest, but I don’t watch their shows. They are always slick and well prepared. Sometimes I think they might be too slick and too well prepared, they barely put a foot wrong and that can get boring. I feel I’m probably one of the few Eurovision fans that have never watched Melodifestivalen. I have been tempted, but six weeks of shows is a bit too much of a commitment. I like to watch the Swedish selection shows, mainly due to the production value just being higher than in many other countries. This count for the shows itself, but also the songs. I often get annoyed hearing national final entries, which sound like they are demo versions. That doesn’t happen in Sweden. No matter if I like the songs or not, I know they are fully produced. Contrary to many other Danish fans, I am in no way obsessed with Sweden nor Melodifestivalen. I am fine to miss a show or two – and I don’t put them on re-cap, but if I am available to watch them, I do.